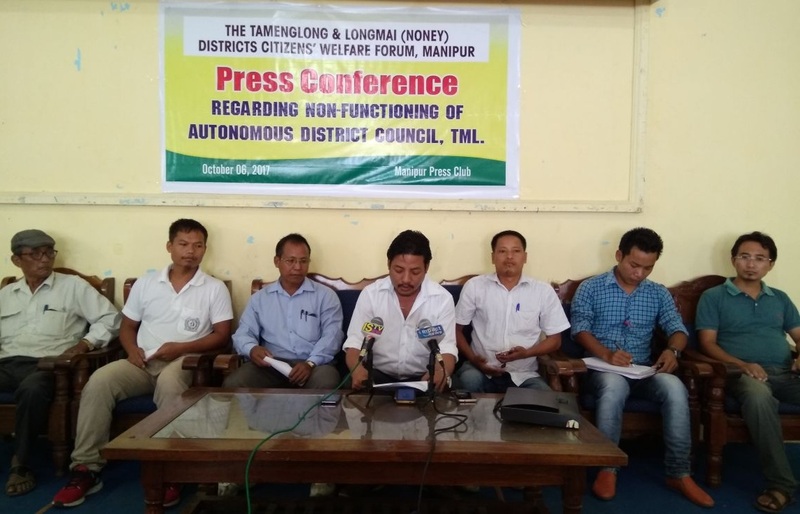 Imphal, October 6: Tamenglong and Longmai (Noney) District Welfare Citizens’ Forum has announced to block vehicular movements along the National Highway 37 and halt all national projects along the highway on October 11. The citizens forum announced its agitation reacting to the silence of the government after it had served an ultimatum of October 5 to the chief minister Nongthombam Biren Singh following a memorandum served on September 24 to take up necessary administrative step on the defunct of the Autonomous District Council, Tamenglong. A legal course by way of writ petitions upon another was filed by the incumbent Democratic alliance of Tamenglong. The Forum has no knowledge of the legal discourse, yet abides by the decision of the Court of law. The delay has had direct and collateral damage to the Public for which we, the Forum, appeal to the State government and the District Administration to directly intervene and either ask the incumbent chairman to step down or withdraw any legal discourse so as to determine a full-fledged District Council. The forum appealed to all civil society organizations and the public to co-operate for a mutual ambition to achieve a pro-active Local self Government. The forum has many other important issues of adulterated fuel, including, complete shortage of LPG in Tamei area (PMUY) and the frequent road accidents happening on the NH-37, said Rangam. He said there too was a road accident yesterday between Khongsang-Rengpang road resulting in the fatality of one individual and grievous injury of a minor boy. The forum extended all support to the Nungba Area joint Committee to book the culprit/s at the earliest and to rectify the negligence of the Highway task force. However, since the local self -governance is not crystal clear governance, the public cannot approach any of their local council representatives for these basic problems. This primary issue of local self Governance being addressed, we the forum believe, the rest will follow suit sensibly, said Rangam. The forum wholeheartedly welcomes any developmental work and cannot mull over a democratic agitation that deprives people of their day to day welfare. However, this issue has been pending almost six months which seeks an immediate intervention, saidRangam. Shutting down of all government offices beginning from the district administration shall take due course, in case the Government fails to redress the exigency of the burning public issue, cautioned Rangam.